The Earth at different points in its orbit. Earth's orbit is the path through which the Earth travels around the Sun. The average distance between the Earth and the Sun is 149.60 million kilometers (92.96 million miles) and a complete orbit occurs every 365.256 days (1 sidereal year), during which time Earth travels 940 million kilometers (584 million miles). 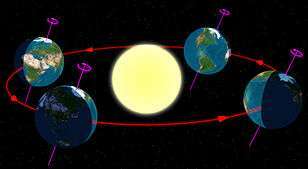 Earth's orbit has an eccentricity of 0.0167. Earth's orbital motion gives an apparent movement of the Sun with respect to other stars at a rate of about 1° per day (or a Sun or Moon diameter every 12 hours) eastward as seen from Earth. [nb 1] Earth's orbital speed averages about 30 km/s (108,000 km/h; 67,000 mph), which is fast enough to cover the planet's diameter in seven minutes and the distance to the Moon in four hours. Viewed from a vantage point above the north poles of both the Sun and the Earth, the Earth would appear to revolve in a counterclockwise direction about the Sun. From the same vantage point, both the Earth and the Sun would appear to rotate in a counterclockwise direction about their respective axes. Heliocentrism is the scientific model which first placed the Sun at the center of the Solar System and put the planets, including Earth, in its orbit. Historically, heliocentrism is opposed to geocentrism, which placed the Earth at the center. Aristarchus of Samos already proposed a heliocentric model in the 3rd Century BC. 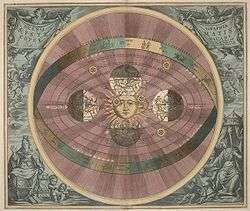 In the 16th century, Nicolaus Copernicus' De revolutionibus presented a full discussion of a heliocentric model of the universe in much the same way as Ptolemy had presented his geocentric model in the 2nd century. This 'Copernican revolution' resolved the issue of planetary retrograde motion by arguing that such motion was only perceived and apparent. "Although Copernicus's groundbreaking book...had been [printed] over a century earlier, [the Dutch mapmaker] Joan Blaeu was the first mapmaker to incorporate his revolutionary heliocentric theory into a map of the world." Because of Earth's axial tilt (often known as the obliquity of the ecliptic), the inclination of the Sun's trajectory in the sky (as seen by an observer on Earth's surface) varies over the course of the year. For an observer at a northern latitude, when the north pole is tilted toward the Sun the day lasts longer and the Sun appears higher in the sky. This results in warmer average temperatures, as additional solar radiation reaches the surface. When the north pole is tilted away from the Sun, the reverse is true and the weather is generally cooler. Above the Arctic Circle and below the Antarctic Circle, an extreme case is reached in which there is no daylight at all for part of the year. This is called a polar night. This variation in the weather (because of the direction of the Earth's axial tilt) results in the seasons. By astronomical convention, the four seasons are determined by the solstices—the two points in the Earth's orbit of the maximum tilt of the Earth's axis, towards the Sun or away from the Sun— and the equinoxes—the two points in the Earth's orbit where the Earth's tilted axis and an imaginary line drawn from the Earth to the Sun are exactly perpendicular to one another. The solstices and equinoxes divide the year up into four approximately equal parts. In the northern hemisphere winter solstice occurs on or about December 21; summer solstice is near June 21; spring equinox is around March 20; and autumnal equinox is about September 23. The effect of the Earth's axial tilt in the southern hemisphere is the opposite of that in the northern hemisphere, thus the seasons of the solstices and equinoxes in the southern hemisphere are the reverse of those in the northern hemisphere (e.g. the northern summer solstice is at the same time as the southern winter solstice). In modern times, Earth's perihelion occurs around January 3, and the aphelion around July 4 (for other eras, see precession and Milankovitch cycles). The changing Earth-Sun distance results in an increase of about 6.9% in total solar energy reaching the Earth at perihelion relative to aphelion. Since the southern hemisphere is tilted toward the Sun at about the same time that the Earth reaches the closest approach to the Sun, the southern hemisphere receives slightly more energy from the Sun than does the northern over the course of a year. However, this effect is much less significant than the total energy change due to the axial tilt, and most of the excess energy is absorbed by the higher proportion of water in the southern hemisphere. The Hill sphere (gravitational sphere of influence) of the Earth is about 1,500,000 kilometers (0.01 AU) in radius, or approximately 4 times the average distance to the moon. [nb 2] This is the maximum distance at which the Earth's gravitational influence is stronger than the more distant Sun and planets. Objects orbiting the Earth must be within this radius, otherwise they can become unbound by the gravitational perturbation of the Sun. 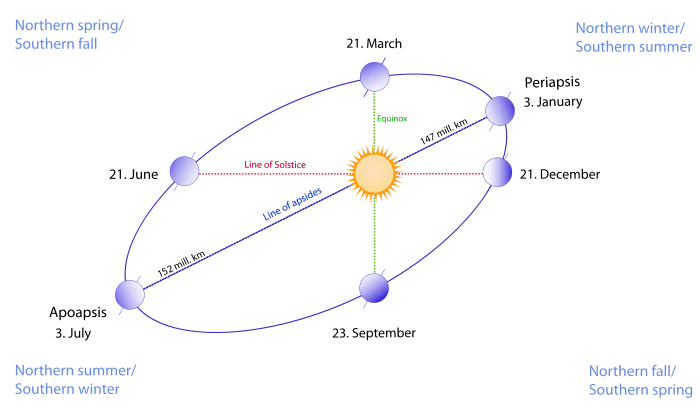 The following diagram shows the relation between the line of solstice and the line of apsides of Earth's elliptical orbit. The orbital ellipse goes through each of the six Earth images, which are sequentially the perihelion (periapsis—nearest point to the Sun) on anywhere from January 2 to January 5, the point of March equinox on March 19, 20, or 21, the point of June solstice on June 20,21, or 22, the aphelion (apoapsis—farthest point from the Sun) on anywhere from July 3 to July 5, the September equinox on September 22, 23, or 24, and the December solstice on December 21,22, or 23. Note that the diagram shows an exaggerated representation of the shape of Earth's orbit. The actual path of Earth's orbit is not as eccentric as that portrayed in the diagram. Because of the axial tilt of the Earth in its orbit, the maximum intensity of sun rays hits the earth 23.4 degrees north of equator at the June Solstice (at the Tropic of Cancer), and 23.4 degrees south of equator at the December Solstice (at the Tropic of Capricorn). 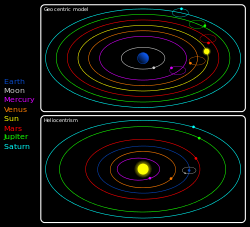 Mathematicians and astronomers (such as Laplace, Lagrange, Gauss, Poincaré, Kolmogorov, Vladimir Arnold, and Jürgen Moser) have searched for evidence for the stability of the planetary motions, and this quest led to many mathematical developments, and several successive 'proofs' of stability for the Solar System. By most predictions, Earth's orbit will be relatively stable over long periods. In 1989, Jacques Laskar's work indicated that the Earth's orbit (as well as the orbits of all the inner planets) can become chaotic and that an error as small as 15 meters in measuring the initial position of the Earth today would make it impossible to predict where the Earth would be in its orbit in just over 100 million years' time. Modeling the Solar System is subject to the n-body problem. ↑ Our planet takes about 365 days to orbit the Sun. A full orbit has 360 degrees. That fact demonstrates that each day, the Earth travels roughly 1 degree in its orbit. Thus, the Sun will appear to move across the sky relative to the stars by that same amount. where m is the mass of the Earth, a is an Astronomical Unit, and M is the mass of the Sun. So the radius in AU is about: . 1 2 aphelion = a × (1 + e); perihelion = a × (1 – e), where a is the semi-major axis and e is the eccentricity. ↑ The reference lists the longitude of perihelion, which is the sum of the longitude of the ascending node and the argument of perihelion. Subtracting from that (102.937°) the node longitude of 174.873° gives -71.936°. Adding 360° gives 288.064°. That addition does not change the angle but expresses it in the usual 0-360° range for longitudes. ↑ Jean Meeus, Astronomical Algorithms 2nd ed, ISBN 0-943396-61-1 (Richmond, VA: Willmann-Bell, 1998) 238. The formula by Ramanujan is accurate enough. 1 2 Williams, David R. (2004-09-01). "Earth Fact Sheet". NASA. Retrieved 2007-03-17. ↑ De revolutionibus orbium coelestium. Johannes Petreius. 1543. ↑ Jerry Brotton, A History of the World in Twelve Maps, London: Allen Lane, 2012, ISBN 9781846140990 p. 262. ↑ "What causes the seasons? (NASA)". Retrieved January 22, 2015. 1 2 "Date & Time of Solstices & Equinoxes". August 28, 2013. Retrieved Jan 22, 2015. ↑ Aphelion is 103.4% of the distance to perihelion. See 'Orbital characteristics' table. Due to the inverse square law, the radiation at perihelion is about 106.9% the energy at aphelion. ↑ Williams, Jack (2005-12-20). "Earth's tilt creates seasons". USAToday. Retrieved 2007-03-17. ↑ Vázquez, M.; Montañés Rodríguez, P.; Palle, E. (2006). "The Earth as an Object of Astrophysical Interest in the Search for Extrasolar Planets" (PDF). Instituto de Astrofísica de Canarias. Retrieved 2007-03-21. 1 2 3 4 5 Simon, J.L. ; Bretagnon, P.; Chapront, J.; Chapront-Touzé, M.; Francou, G.; Laskar, J. (February 1994). "Numerical expressions for precession formulae and mean elements for the Moon and planets". Astronomy and Astrophysics. 282 (2): 663–683. Bibcode:1994A&A...282..663S. ↑ Allen, Clabon Walter; Cox, Arthur N. (2000). Allen's Astrophysical Quantities. Springer. p. 294. ISBN 0-387-98746-0. ↑ The figure appears in multiple references, and is derived from the VSOP87 elements from section 5.8.3, p 675 of the following: Simon, J.L. ; Bretagnon, P.; Chapront, J.; Chapront-Touzé, M.; Francou, G.; Laskar, J. (February 1994). "Numerical expressions for precession formulae and mean elements for the Moon and planets". Astronomy and Astrophysics. 282 (2): 663–683. Bibcode:1994A&A...282..663S. ↑ "What is the significance of the Tropic of Cancer, Tropic of Capricorn, Arctic Circle and Antarctic Circle?". Retrieved Jan 22, 2015. ↑ Laskar, J. (2001). "Solar System: Stability". In Murdin, Paul. Encyclopedia of Astronomy and Astropvhysics. Bristol: Institute of Physics Publishing. article 2198. ↑ Gribbin, John (2004). Deep simplicity : bringing order to chaos and complexity (1st U.S. ed.). New York: Random House. ISBN 978-1-4000-6256-0. ↑ "Earth-Venus smash-up possible". June 11, 2009. Retrieved Jan 22, 2015.